Merida’s heat has been building, and lately our upstairs bedroom/solarium has been getting hotter every night. March in Merida generally kick’s-off the annual HOT season here, with temperatures rising through April, to hit 104º – 115º F peaks in May. Mid-June often brings a little relief with the start of Rainy Season – as the daily afternoon rains come in as ~ cool fronts ~ which is a great contrast to Washington DC and the Eastern Seaboard, where afternoon summer showers mean steamy muggy nights of heat intensified by humidity. ~ At bedtime: Shut off everything in your house, go out and read your electric meter – XXXX kW-hr. Write it down. Turn on your A/C and run it in the usual way. ~ Next morning: Go read your electric meter – XXXX kW-hr. Write it down. ~ Subtract the bedtime reading from your morning reading to get you kW-hr per night. ~ Multiply that kW-hr of electricity used per night times your average CFE electricity rate ( $ pesos per kW-hr ) for that month to calculate how much it cost for that night of air-conditioning. ~ e.g. Just how big an effect is it to cool to 20ºC vs. 25ºC? 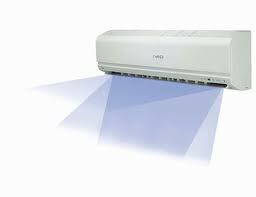 ~ Is it worth retiring an old low-EER air conditioner, to buy a new high-EER “inverter” air conditioner? How long will it take to recover the cost of the new A/C? ~ How many hours will you run the AA por dia? ~ How cool do you want the room? a.k.a. What temp to set the A/C? ~ How big is your room and your AC / AA ? ~ What season is it? ~ Hot season (April – Sept) has lower CFE rates, while CFE raises rates for the “Cool Season”. Hot season CFE rates for Merida can mean $0.6 peso per kW-hr rates versus $2.8 peso cool season rates => a 4X difference in what you pay to cool the bedroom . . . .
~ How efficient is your AA ? and How big is your AC ? Is it a big old inefficient ~ 2,600Watt ~ 12.2A ~ 24,000 BTU unit ? 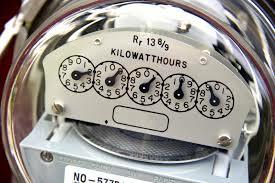 This points to the Energy Efficiency Ratio (EER): How much cooling (BTUs) do you get for every Watt of electricity? Efficient modern AA’s have EER’s of “14” or higher. A quick EER calculation of our old split A/C ~ 2,600Watt ~ 12.2A ~ 24,000 BTU unit, gives an EER of a very shabby ” 9.2 ” EER. ~ bleah ~ This means our old A/C uses 62% more electricity to get the same cooling as a newer 15 EER unit. 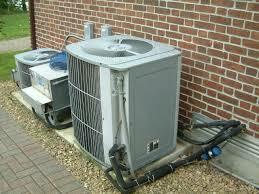 ~ What duty cycle does your A/C use to keep that room cool for your current outside temperatures + window & door quality? Duty Cycle is just a fancy way of saying that out of every 10 minute period, how many minutes is your A/C compressor running? The A/C fan only uses about 75W – 120W, so we really only car about the big 2,000 Watts that the compressor uses when running. If your thermostat is set to a high temperature (like 25º C = 77ºF) then the Duty Cycle is likely short ( e.g. => 0.20 ) then your A/C compressor is only running 20% of the time. If your thermostat is set to a low temperature (like 20º C = 68ºF), then an A/C in a poorly insulated room may have a high Duty Cycle (e.g. => 0.8) then your A/C compressor is running 80% of the time. Notice that lowering the thermostat to 20ºC can quickly cost you 4X more than keeping it at 25ºC. Our big old ~ 2,600 Watt ~ crummy low-EER A/C runs at a ~ 100% duty cycle ~ for about 1 hour to cool our hot 2’nd story solarium bedroom (Temp set at 23ºC), and then I get up and raise the thermostat to 26º C to get a modest ~ 25% duty cycle ~ for the rest of the night. We turn on the A/C at 10:00 PM and then off at 7:00 AM => 10 hr of operation. 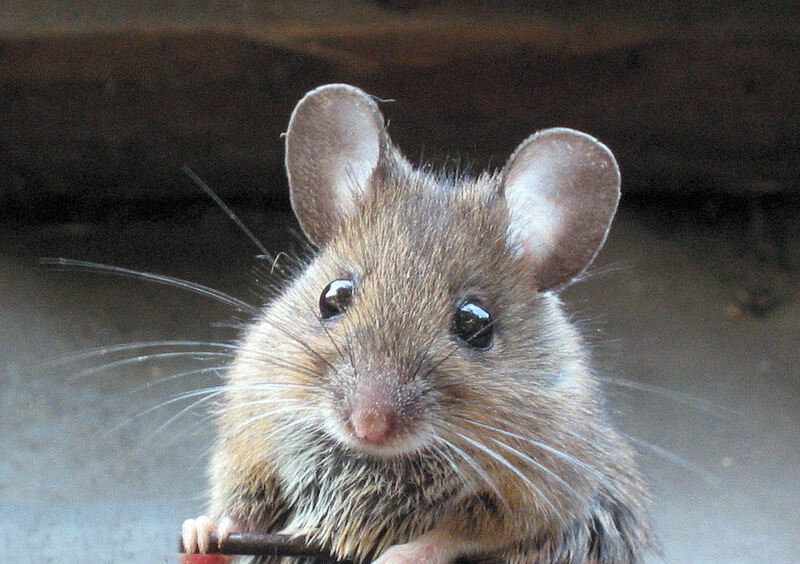 We live like church-mice – so we rarely go into the high rate “Excedente” and never into the “DAC” rate category, so our typical CFE rate is about $0.8 pesos per kW-hr. =>$6.7 pesos a night to modestly cool our bedroom to 26ºC (79ºF). =>$140 pesos a month to modestly cool our bedroom to 26ºC (79ºF). Dropping the thermostat to 20ºC increases the duty cycle by at least 4X. Using more than the 175 kW-hr/month low-usage CFE category bounces the rates up 3.5X higher. =>$94 pesos a night to heavy cool our bedroom to 20ºC (68ºF) at high CFE categories. =>$1965 pesos a month to heavy cool our bedroom to 20ºC (º68F) at high CFE categories. So, savvy readers realize that cooling to 20ºC by ~ heavy-energy user homes ~ during the cool season ~ can cost over $100 pesos a night . . . . Hint: Running a simple 75W floor fan that circulates air directly onto you while sleeping can allow you to set the air conditioner at 26ºC (78ºF) ~ and have it feel like 23ºC (73ºF) ~ while using 50% less electricity. 18 Responses to Just how much does it Cost to Cool a Room in Mexico? An economical way to lower the temperature is to cover your roof with highly reflective sellador. One recommendation is Sokul made by Impac. Cheapest price I have found is 764 pesos for 19 lts pucket at Fernandez downtown. They will deliver for free, just call them.9281096 It lowers the roof temperature up to 5 degrees C. during the heat of the day. Concrete gives off heat during the night, so the cooler you can keep the walls and roof, the less you have to cool. It also is water proofing and lasts for 6 years. The overall cost, application (labor) and material, should be around 40 pesos a sq. meter. Money well spent. Have you ever measured the temperature of the same roof with normal white impermebiliazante (like Fester) versus magic super-duper “highly reflective sellador” ? or are you reading manufacturer’s claims? I have only measured the temperatures of 2 roofs – each with side-by-side sections of normal white impermebiliazante next to special “highly reflective sellador”? Using a high-end laser well-calibrated Fluke temperature gun, a different brand of magic sellador section’s temp was 1/2º cooler than ordinary Fester, and the other roof’s section with special highly reflective sellador was the same temperature as the Fester section – both sets of measurements made at about 2 pm on a sunny day in Yucatan. I measured temperatures from above and below – in representative/equal sections of roof for each sealer. I really hope that there is reflective sellador that truly works better than normal bright white sellador. I have only tested 2 magic “heat reflective” selladors, and neither one worked as promised, but that does not mean that all fall short of their promises. Maybe I was unlucky with those first 2 “heat reflecting” selladors? Of course, that is a bucket not a pucket from up north. Something people overlook, because US homes are typically built with vapor barriers, is concrete and block allow moisture to pass which for most is a huge factor to that makes a home uncomfortable. In engineering they have charts that show the misery index of moisture-temperature ratios. Having a moisture barrier layer aids in AC efficiency and in comfort. I painted one insulated room (R9 walls, R30 roof) with the white roof elastomeric paint on all the outside walls and roof to prevent moisture migration. Also have double pane UV A&B reflective e-glass windows. Roughly a 225 sq foot highly windowed bedroom that I use the smallest minisplit I could find, a 7000 BTU 110VAC at 4 Amps, and I wake up with chapped lips is how dry it gets with such a small AC unit.. It is incredibly cost effective and comfortable, uses 3-5 kWh per night at 74 degrees because I do have to turn it on 2 hours before I go to sleep. So vapor barriers work, I go in friends’ homes that have full time AC and it is cool but not real comfortable, it is like a wine cellar with humidity because the AC cannot keep up with the moisture migration. I picked that size AC so that a small honda 1000 generator could run the AC after a hurricane and not use a lot of fuel per night. So I would suggest painting your bedroom including walls white with the elastomeric paint could really make your night’s sleep more comfortable and a lower cost and also good for the environment with less kWh used. If you cannot do the outside maybe the interior, have not read about such use ask reseller if it can be used indoors. You just need to stop the flow of moisture which other paints do not do. You could add a polyethylene and drywall your sleeping room too. We built a new home in Chelem, Yucatan. We had individual units in each rooms. Electric bill ran over $2,000 US each month. Why don’t they lower the elec.l rates. People burn up if they are from the states. Is it the government or who? The elec. is rediculous. Looks like someone could build a gas central air for the entire house…..anyone knows? I still love the Yucatan. Yeah, the beach communities have especially high CFE rates. USA & Canada pay out huge govt. subsidies to their electricity producers, (via monster projects funded by the govt), that the electricity prices seem so much cheaper there. If you don’t use much electricity, CFE has some of the lowest rates in the world … at just 4 cents a kWh… for using a TV & fridge & a few lights… like a poor person. If you use large amounts over the 850 kWh a month limit… (for Merida) … you get popped up into the super high DAC rates… losing all govt. subsidies, paying even higher rates… until you get your running average use down below the 850 kWh (Merida) threshold. Prices are excellent right now. Steve: that is the best explanation I have read, thanks. wow! $2,000 dollars is extreme. do everything you can to reduce use, only cool the area you are in, turn off extra lights, etc. I was able to justify 2 meters. We actually have two full kitchens, bathrooms, living rooms, and bedrooms on separate floors, like a rental unit. A little rewiring and I split my load, both meters are running in the lowest rate. this is the hardest. let your body adjust to the climate. turn those AC units down, get accustomed to 85 degrees, it is actually healthier. side note: businesses always pay the high rate. brutal for those that must have refrigeration for their products, or that need to use heavy machines. where is Eric Briehl located and how do I contact him. I sent you an email, a few days ago. Thanks for the info. How much is a solar system? The house I will be building is about 2000Sf. How is this system installed. Here in the states, the system just about pays for the electricity that we use. Is this the case in the Yucatan? You were so sweet to respond to me.l This might be something to think about. Where do you get this system and can a regular contractor install this? I just can;t do the $2,000/mo again. I appreciate your patience in waiting a day for me to get you a quote for a fine PV solar system from an EXCELLENT local installer. (at $18.38 exchange rate… so change the estimate to factor in the current 19:1 MXN to USD exchange rate). These quoted figures are ESTIMATES… based on a typical installation. Prices VARY depending on your situation. What is the best type of air conditioner to buy in Merida? How many BTUs do you recommend for 20 sq m bedroom? 18,000 – 24,000 BTUs, depending on how much heat it gets from sun-exposed roof, walls, windows & patio doors…. and depending on how quickly you want to cool the space down. Hotter room … wanting quick cool downs, then go with 24,0000 BTUs. A 12,000 BTU unit could work for a shaded 20 sq. first floor room that borders on a cool shaded garden – esp. in a cooler part of Merida … versus a hot-hot Centro-asphalt & concrete-canyon, with a black moho-coated roof & sun-scorched walls that requires a big capacity A/C. A second story room with a black sun-heated moho-coated roof, with a big patio door allowing in lots of direct sunlight, that opens onto a hot unshaded tiled terrace, and sun-heated walls could need a 24,000 BTU unit. Further, do you want to let the bedroom get really hot during the daytime, and then turn on the A/C only for a few hours at bedtime to quickly cool down the room? … If so, then a 24,000 BTU AC may be needed to quickly cool down the room. If the bedroom does not get that hot, and you are willing to start the A/C unit a little before bedtime, then a 12.000 BTU unit ~plus a good floor fan blowing directly onto you in bed ~ may serve you just fine. … We have a 16 sq. meter 2’nd story bedroom that cools off just fine with an 18,000 BTU unit – set on medium settings – plus a floor fan blowing onto our bed => a combination that works fine for cooling off our hot bedroom, to 25º – 27º sleeping temps. Alternately, an 18,000 BTU INVERTER unit (high efficiency) that runs much of the time … so the room never gets too hot during the daytime … is likely your best choice. Inverters must be run for longer times, because they do NOT cool as quickly, but they offer 30% – 60% energy savings. If you choose an inverter … then the issue of what brand is the next issue. We’ve personally had really good luck with LG air conditioners. Old line brands like Carrier & Trane have solid reputations … and decent access to parts over time – but often more expensive. Mirage: A mid-line to cheaper brand … Good access to parts here in Merida & many repair~guys who know Mirage. All the variations of cheaper Chinese units: Hi-Sense et al. … They are so new, it’s difficult to say – as they have no track record. One tenant of ours installed a Hi-Sense airconditioner 3 years ago that has worked very well … but who knows how well it work 10 years from now. Thanks, I found that very useful. I am planning on moving to Merida this year. It is well worth reading for all who live in or are planning to live in Merida.